Credit Cards are one of the easiest and quickest ways people get into debt. They have varied interest rates, depending on the credit card you apply and qualify for. Qualifying for a credit card is easy, and the interest rate that you get given on that card is adjusted to reflect your credit score. So, if you have a good credit score you will be able to access a credit card with a lower interest rate. However, if you have a poor credit score you may only be able to access credit cards with a much higher interest rate. If you are one of those people who have credit card debt, which most people who do not have a zero balance are classed as in debt, then you have a few options, especially when it comes to becoming debt free. The options that are available to you are listed below. You should be able to find an option which best suits you and your individual requirements. You may be able to become debt free quicker than you may think. If you've got money to pay off your debts you may be in a better position than most other people. So, you need to use this extra money in the best way possible. If you are lucky enough to have some money hidden away somewhere, maybe for a rainy day, then you need to use this to repay some of your credit card debt. If you have multiple credit cards, you need to repay the credit card provider with the most urgent debt attached to them. This could be because you have fallen behind with repayments, or it could simple be the credit card provider that charges the most interest. This extra money that you think you have could be a mirage. You need to think carefully before committing any extra or spare money you may have to pay towards a credit card debt. If your money is from a savings account, that is great. You can use this money to repay your credit card debt. However, if you believe you have money spare at the end of each month, you need to double check to see if this money is not tied into any priority debts. Priority debts include repayments on a mortgage, on rent or council tax debts. These priority debts are vital. You must not fall behind with any of these payments. Where you may think you have extra money at the end of the month to repay credit card debt, could be safer being used to ensure that these priority debts are paid. All other debts are classed as non-priority debts, and this is where your credit card debt is placed. Even though the classification of this debt can seem quite nonchalant, these debts must still be paid off. This is the position most people find themselves in. They simple do not have the extra or surplus money available to repay their debts, including credit card debt. Fortunately, there are places which can help with credit card debt and get you back on a good financial path. A Debt Management Plan (DMP) forms part of an informal agreement between yourself and your creditors. Within this arrangement both parties agree upon a repayment plan that helps repay your credit card debt in regular installments. You may have to speak to a DMP provider, who will work on your behalf to agree and establish this new arrangement. Some DMP providers will charge you for using this service, so it is important that you do some research around these debt management plan providers before you may any financial commitment to them. Some organizations and individuals advise that you should never have to borrow more money to pay off existing debt. To them you must ask “have you ever been in debt before”? How you make arrangements in repaying your credit card debt is entirely up to you. You must choose an arrangement that works best for you and your own financial situation. A debt consolidation loan allows you to repay your existing debt with another, larger loan. This larger loan can bring benefits as well. If you choose to consolidate your existing debt with a larger one, then you may receive a lower interest rate. This is because you have taken out one larger debt compared to several smaller debts spread over different credit card providers. Much like a debt management plan, it is important to consider everything. You should research debt consolidation companies in full to ensure that they are reputable. You may be able to set up a debt arrangement scheme with your local authority. These programs help those people who are crippled with debt, from credit card, loans, overdrafts and even priority debts. Some of you may be lucky enough to be able to write off some of your credit card debt by speaking with your credit card providers directly. If you have no extra or surplus cash, and can demonstrate this to them, they could agree to pause interest on your credit card or reduce some of what you owe to them. However, they will come at a cost. Your credit card provider may ask you to refrain from using the card for a period of time, or may close your account so you are unable to use the credit card for the duration that your debt is outstanding. This can be the last point of call for some people, and so it should be. You should never look at declaring yourself bankrupt as a first, second or even third option. Use bankruptcy if there is nowhere else to go and no other solution available to you. 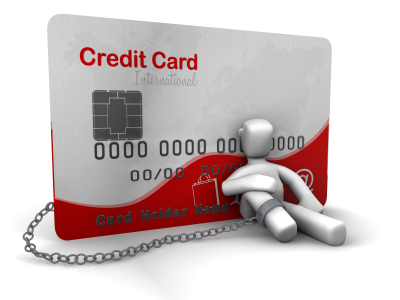 Bankruptcy may only be considered if you have a large debt on a credit card or credit cards.